My plans to travel the world throughout my twenties. So long and thank you to all of you. Maintaining this blog has taught me so much about traveling, the audience I was searching for and about my own writing. Just like my 17 years of schooling has taught me everything I know today. I have spent most of my life, so far, in school. From 5, I have been up early in the mornings and doing homework in the evening. In exactly 10 days from now, life as I know it will be ending. I will know longer have summer or winter breaks. I will know longer be having a first day of school in September. I will expected to be a functioning adult in society with a 9 to 5 job, thinking about health insurance and a 401k. Unfortunately as my schooling comes to an end, this blog will also be coming to an end. So instead of continuing to make a small splash in the ocean of travel blogs, I want to give you all the direction to two excellent blogs I had the pleasure of following for advice and just for pleasure. These blogs are Little Grey Box and Ellie Goes on Holiday. Please enjoy them just as much as I do! Thank you for all your patience and support! It ain’t cheap or easy. We all know it. Travel isn’t cheap and it definitely isn’t easy. Because of that, planning is a super important part of any new adventure. I’m a pretty avid BuzzFeed reader and they always post stuff about travel. Which works our pretty well for me. This post is talking about apps and how they can make travel easier. And we all know we could use the help. Some of the apps are a little useless for abroad travel (outside the US) and are location specific but the others are great! My first favorite has to be Travel Math. It’s pretty cool and will literally tell you anything about your trip that has to do with numbers. And numbers definitely aren’t my strong suit. I try to avoid math at all times so I’m probably going to download this app ASAP. The next is Pack Point. You put in the location, the app will tell you what you need to pack. This is genius. I’ve needed this app for my entire life. I am constantly packing for the wrong weather or forgetting that I’m going somewhere fancy. I’ve actually forgotten pajamas more than once. This is the app I’ve been searching for. Jet Lag Rooster is a pretty smart idea. The app tells you how to shift you sleeping schedule around a few days before you trip so you’re not a zombie the first day there. If you’re paying a stupid amount of money to be there, who would want to waste a day being jet lagged? Not me! My TSA is another genius app. I can’t even tell you how many times I’ve searched the Internet looking to see what I can and cannot bring on a plane, how to store certain things and what is considered a carry on. It also tells you how long the wait lines for security are so you can plan you arrival at the airport accordingly. I’m always talking about getting the “locals experience” and Vayable will help you do that. The app gives you unique experiences for your destination offered by the locals themselves. How awesome! This is another app I need to download ASAP. Don’t get me wrong there are some other great apps on the BuzzFeed list but these five I think would be the most useful to me and they are the smartest. There are some weird apps on the list also that don’t have much to do with travel, like LogMeIn, Dude Where’s My Car? (which I need for home not travel) and WiFi Finder, but they could be useful to someone who wants to stayed plugged into their home world. I, on the other hand, love the idea of using my phone strictly for pictures and staying off the grid. The Wizarding Adventure of Harry Potter. If you don’t know me personally, I am a huge, nerdy Harry Potter fan. I cried at the end of the Deathly Hollows movie because it was the end of my childhood. So this post is for all you, like me, who want to combine two loves. Harry Potter and traveling. Not a very hard task if you ask me. As you should all know, Harry Potter was written and filmed in the beautiful (yet sometimes gloomy) Great Britain. I would give up a fully paid trip to Harry Potter World in Orlando to scrap together money in order to take the Harry Potter self-guided tour of Great Britain. Who needs tour groups? I definitely don’t. I want to start off in Scotland. I know a few of the scenes were filmed in Scotland so it sounds like a great starting place. Also, it’s absolutely gorgeous. This just happens to be the famous bridge the Hogwarts Express crosses every year on its way to Hogwarts (in reality it’s Glenfinnan Viaduct). Located in between Fort William and Mallaig, Scotland. Another scene of Scotland related to Harry Potter is Glencoe. Dramatic scenes of Hogwarts, sign me up! Steal Falls, used for the Tri-Wizard Tournament, let’s go! Fun fact, the area was also used for Braveheart. Moving onto England. The bulk of the Harry Potter adventure. From the countryside to London, Harry Potter was mainly filmed here. On this lovely little list from VisitBritain, we have castles and markets and King’s Cross and the London Zoo. And for our last stop along the way. Wales. It might also be the coolest location. This is the hideaway of Harry and pals in the Deathly Hallows. This is also where Dobby is buried (yes I definitely cried at this scene). 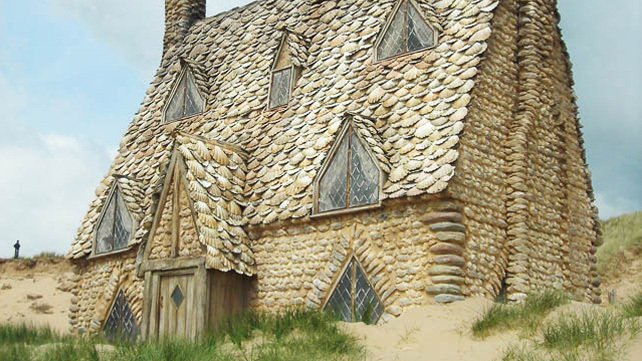 The cottage was built specifically for Harry Potter but I would have gone hear even if it had no ties to HP. So I just found these locations from a couple different websites but I would love love love if anyone could help me out and give me more locations you think it’s worth visiting in relation to Harry Potter, both book and movie. I look forward to hearing for you awesome HP nerds. I can’t wait to go there! Huge Harry Potter Fan!! The world is full of so much wonder. True, we have the eight wonders of the world but there is so much more than that. Each continent is its own world. Each continent has its own people. Each continent has many different cultures. North America, for instance, has three separate countries all of which that have three separate worlds of their own. Canada is seen as the politest country but there is so much more than that. They have the Inuit lands, Toronto, French Canada and Nova Scotia. Go to any of those places and try to tell me that they don’t live in their own little worlds. Who knows you might even find someone incredibly rude and hateful. I don’t even know where to begin with the United States. Every region of the country is so different from the last. The West Coast and the East Coast. North and South. We may all be Americans but we all have our own subcultures that we live and die for. Mexico is a whole other story. It is so vastly different from its northern counterparts. South of the Border means a rich and deep culture that cannot be compared to any other. Spanish speaking, agriculture working, and loudly celebrating people. As of right now, North America is my expertise when it comes to wonders of the world but go big or go home right. I’m trying to learn it all. The beautiful traditions of the Chinese, the alcohol driven heaven that is Oktoberfest (which I may be attending this fall), the induction of a new Pope in the Vatican. I want to see all of the strange, different, yet amazing traditions that I only get to see on TV or in the news. Each continent is its own world. Each country is its own world. Each culture is its own world. And they make up not the eight wonders of the world but the infinite wonders of the world. “Thank you for flying United Airlines. We have now arrived at South Carolina’s Charleston International Airport.” came through the intercom just as the wheels hit the ground of the tarmac. All of this started when my sister told me she was going to South Carolina in May. I was pretty jealous and mad she didn’t invite me so I made some snarky remark of “Why didn’t you invite me jerk?”. This prompted her to ask if I really wanted to come. Then last week, she texted me to ask if I was still interested in going and that she convinced mom to pay for the flight as a graduation present (I was so down for someone else paying). I obviously agreed to take my mom up on that offer and my tickets were booked the next day. So two weeks after I become a legitimate adult (scary thought), I will be flying to Charleston, SC and frolicking around the city with my sister and her friend. My first trip of the year! Well graduation is right around the corner and I’m finally getting my dream come true! I am leaving the country for a month-long trip. Now I haven’t really worked out the details but it’s all for free! You heard right, FREE. My trip will be funded entirely by the renowned travel expert, Alexander Supertramp. He decided instead of burning all his money that he would pick a recent college graduate to fund their trip. He also said I could bring whoever I want! I picked my sister and we’re start the planning tomorrow. As of right now, we’re starting off hiking the entire Great Wall of China and then meeting with some North Korean officials. After those two days, we venture into Europe and cruise around with some local gypsies. They plan on showing us some of their hangouts and favorite places to visit. (I know it won’t be off the beaten path but hey it’s free!) And to top it all off, we’ll end the trip with a dinner at Buckingham Palace with the Queen, Prince Harry and William. I don’t think Kate will be there though, she may be having a baby or something. And in case you’re in the celebrating mood, Happy April Fool’s Day! Our lives are constantly pressured by time. Deadlines, schedules, itineraries. We are given a certain amount of time and we are supposed to make the most of it. Especially when traveling. It’s one of the hardest deadlines we have. We are only given a set amount of days in a foreign territory and we have to explore it all. Every sight must be seen and all the food must be tried. We have the briefest of times to become one with this new culture we are thrown into. Then, as soon as it began, it’s over. We’re boarding the flight back home and back to reality. More deadlines. More schedules. But we will always go back as a whole new person. I have the opportunity to co-author a blog with a funny guy Robert. We are big people watchers and love seeing people do stupid stuff! So we decided to make it into the mecca of stupid people doing stupid stuff. We’ll be posting this week about working as a server, written by yours truly. In a restaurant full of old people. Check it out if you will!